The ACT® Work Ready Communities initiative is a core element in the effort to build a truly national system for work readiness. At the core of this aspiration sit ACT WorkKeys National Career Readiness Certificates (ACT WorkKeys NCRCs) that focus on certifying three essential skills - applied math, workplace documents, and graphic literacy. The ACT WorkKeys NCRC is an evidence-based credential that has been proven to accurately predict work readiness and job performance. And, this predictive power applies to all three key groups of people: new workers, transitioning workers and individuals who already have jobs. These Certificates - and the skills they verify - help assure employers that the people hired and/or advanced will succeed. The Certificates also act like passports - regardless of where an individual lives or moves, the Certificates testify to work readiness. And, because the Certificates are a win/win for employers and employees alike, counties that have sustainable, ongoing certification efforts are far more attractive. In effect, counties that are Work Ready Communities have a built in economic development advantage in the eyes of existing employers as well as those contemplating relocations. ACT’s Work Ready Communities Boot Camp is for leaders who want to move aggressively forward into this 21st century approach to work readiness and economic development. 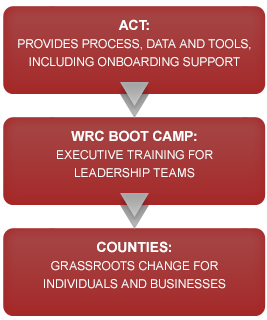 The Boot Camp is a performance-driven program WRC leadership teams use to initiate, deploy and drive carefully tailored county and regional efforts that grow the number of counties certified as work ready. The goal is clear: ‘on board’ and certify your counties. WRC leadership teams shape a goal-oriented strategy that builds on deploying ACT's testing infrastructure and data gathering. However, the strategy must go beyond these two elements - and the ACT WRC initiative helps leadership teams do that by shaping what we call a 'challenge' that makes the most sense for each community's unique circumstances, including - critically - of work readiness. Successful teams are those willing to invest the team time and focus needed to shape and succeed against this challenge-centric approach. THE BASICS: ACT is providing process, tools and data to support building a common platform at the county level for measuring and closing the skills gap based upon the ACT WorkKeys NCRC. The model is built upon partnerships at the national, state and local levels and a Boot Camp approach to provide structure to the start-up and successful launch. WHY COUNTIES? The LINK, ALIGN and MATCHING of the workforce is implemented at the local level. Having a process in place for county leaders to work together to match people to jobs, align workforce goals to economic development and link education and workforce together to improve the skill level is what county-level Work Ready Communities do. THE PLAYERS: Employers, individuals (new to workforce, transitioning, already employed), state leaders, educators, economic development, chambers, workforce professionals, community leaders, families, media and more. THE CHALLENGE: Assist WRC community teams develop a vision statement that serves as the focal point in developing and launching initiative. LEADERSHIP: We help WRC teams figure out who needs to be at the table and how they can assist to make sure success happens. Upon completion of the ACT WRC Boot Camp and implementation of the WRC framework, teams will have successfully established a sustainable, county-based Work Ready Community effort. Successful communities will enjoy established performance metrics and documented return on investment that can be leveraged to integrate and connect current workforce development efforts and to jump start new initiatives. Counties who successfully launch WRC programs aligned with the ACT WRC Common Criteria will receive continued long-term support from ACT to sustain their initiatives post-WRC Boot Camp. ACT offers a county-level program that allows individual counties to join the ACT WRC initiative. ACT WRC accepts applications for WRC Boot Camps year-round. Learn about the steps a community takes in the journey to prove that they are work ready.